Summary: Spirorchiid trematodes or blood flukes are major pathogens of sea turtles and are associated with stranding and mortality worldwide. The diversity of spirorchiids documented in Florida sea turtles surpasses that of any other region. Despite the importance to sea turtle health, none of the life cycles are known for any marine spirorchiid species. Knowledge of parasite life cycles is essential to understanding the epidemiology of infections in the wild, including factors that may affect prevalence and disease in turtles. We will conduct life cycles studies in sea turtle habitat where conditions support transmission of spirorchiids. Gastropods will be screened for developing stages of spirorchiids using a sensitive and specific polymerase chain reaction (PCR) method developed and tested in previous studies. 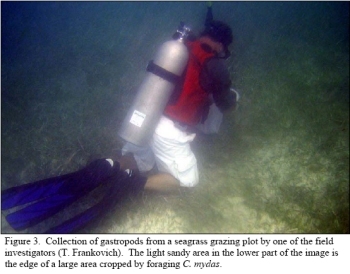 Efforts will target seagrass foraging grounds of loggerhead turtles and grazing plots of green turtles in Florida Bay and the greater Keys region. These studies are essential to the discovery of the parasite intermediate host(s), and thus the unknown life cycle(s), which are a major barrier to our understanding of this important infectious disease.